Salmonella typhimurium is a pathogenic bacterium that causes food-borne infections in humans. Researchers find that Salmonella globally alters a post-translational protein modification called Sumoylation in infected cells and manipulates host’s intracellular transport machinery. Remember that plate of pani-puri which caused instant regret? (Read diarrhoea, fever and vomiting!) Contaminated food and water are significant sources of infections in humans. While the healthy are back to devouring pani-puris in a week or so, infants and individuals with compromised immune systems face life-threatening consequences. One such bacterium causing food-borne infections in humans is Salmonella typhimurium or in short, Salmonella. C. V. Srikanth from the Regional Centre for Biotechnology (RCB), Faridabad along with his team of researchers have identified a new molecular mechanism by which Salmonella manipulates host cells. By reducing global levels of sumoylation in an infected cell, Salmonella alters the activity of critical proteins; one of them being Rab7, a regulator of the vesicular transport pathway. 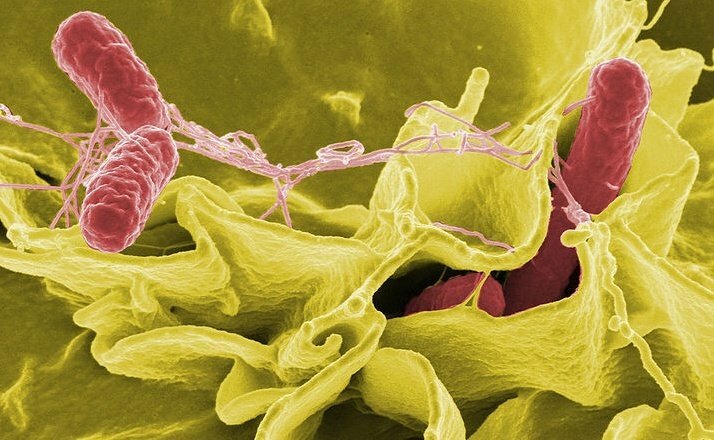 The modus operandi of Salmonella is as follows: it enters our body via contaminated food and water, survives the stomach acids and reaches the intestine. Specific proteins secreted by Salmonella make the intestinal epithelial cells engulf the bacteria to form a vesicle called the Salmonella Containing Vacuole (SCV). SCV has long filamentous structures called Salmonella Induced Filaments (SIFs). Both SCV and SIF formation enable Salmonella to survive in the host cell, multiply rapidly and evade host defence system. SCVs mimic the endosomes of a cell. Endosomes are vesicles or sac-like structures within a cell that are used to transport cargo (e.g. macromolecules) between organelles. Early endosomes form when the cells uptake material from the outside. Early endosomes mature into late endosomes, and if targeted for degradation, fuse with lysosomes which are sacs of enzymes. However, SCVs with their cargo of Salmonella alter the activity of specific host proteins to avoid this degradation and survive in the infected cell. Infection with Salmonella reduced the overall sumoylation levels in the infected cell. Sumoylation is a post-translational protein modification resulting in covalent attachment of protein moieties called SUMOs (Small Ubiquitin-like modifiers) to the lysine residues of proteins. Sumoylation acts as a molecular switch affecting protein function, localisation and stability. The authors wanted to identify the ‘Sumoylome’ (all sumoylated proteins) of an infected cell. Among the several proteins identified was Rab7 (Ras-related protein 7), a well-studied master regulator of the vesicular trafficking pathway. This was interesting because sumoylation of Rab7 was not known earlier. The authors investigated this further and identified the specific lysine residue in Rab7 where sumoylation occurs. Sumoylation affected Rab7’s degradation and its interactions with other proteins. “Getting a clean, specific proteome and identifying the sumoylation residue in Rab7 were laborious experiments,” said Srikanth. “However, each result led to a new experiment, and every experiment was challenging,” said Gayatree Mohapatra, the graduate student who is the first author of this study. Salmonella’s survival depends on the formation and stability of SCVs and SIFs. In cells expressing non-sumoylable mutant of Rab7, both SCV stability and SIF formation were higher suggesting that Rab7 not being sumoylated benefitted Salmonella’s survival. This may be one of the reasons why Salmonella causes global reduction in sumoylation levels in the infected cell. “I don’t think the field has appreciated how post-translational modifications can also be altered by pathogens,” says Mahak Sharma from Indian Institute of Science Education and Research (IISER), Mohali, not associated with this study. “This study has highlighted the importance of looking at post-translational modifications in the context of infections,” Sharma says. “This is the first step, there is a lot to learn about Rab7 sumoylation,” says Srikanth talking about the future offshoots of this work. “Identifying the proteins in Salmonella’s arsenal that alter cellular sumoylation will possibly lead to designing of new drugs to intervene in Salmonella infections in the future,” he adds.